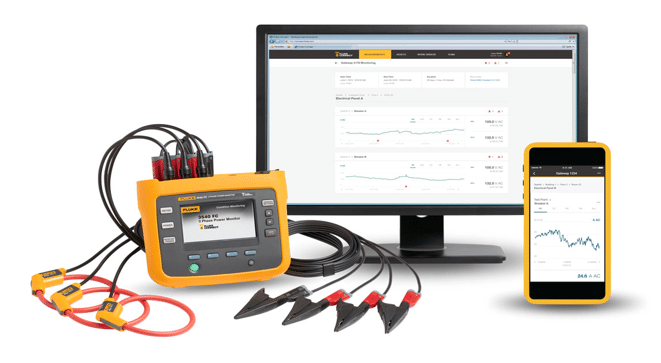 The Fluke 3540 FC Three-Phase Power Monitor and Condition Monitoring Kit is a combination of the 3540 FC Three-Phase Power Monitor and Fluke Connect® Condition Monitoring software. The 3540 FC Three-Phase Power Monitor is a compact device used to monitor key electrical parameters at three-phase machinery and seamlessly streams data to the Fluke Connect Cloud. The software allows maintenance teams to remotely view data anytime, anywhere. Users can graph asset data to discover measurement trends and send alarms when values are outside user-set thresholds.